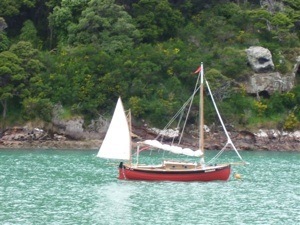 Ian recently attended the Akaroa Classic Boat Festival with his Eun Mara, Islesburgh. Islesburgh was selected as the “Best Boat, Overall.”Congratulations to Ian and his exceptional Eun Mara. For more details see Richard’s Eun Mara site. We went sailing with Alistego yesterday and I thought I might share a few things with our regulars here. The day was in many ways typical for us here in Western Canada. The wind was averaging around 10 kts, which was fine but was gusting (I mean sudden, hairy, immediate, gusts) to 20-25 kts or so. Add to that our usual confused seas of short steep waves coming from all directions (seemingly) and you can get a rough, uncomfortable day of sailing in anything smaller than a keel boat. Other than the wind and waves, it was a warm sunny day. After motoring out of the marina a reasonable distance we raised the mizzen and killed the outboard. After going forward I had the full jib flying just in time to feel the first of the big gusts of the afternoon. Wanting to see what the wind was going to do before deciding on how much mainsail we wanted to put up we set out on just mizzen and jib. 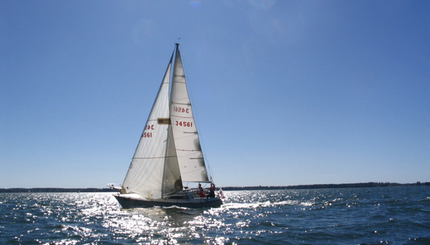 Once again, we proved the boat's inability to tack (in most conditions) without a mainsail, but we did discover that she gybes beautifully and in a very controlled manner if the crew doesn't mind going the long way around for a "tack". Secondly we confirmed again that she will not sail very close to the wind under m and j, especially so if the waves are pushing the bow away from the wind. We proved this all afternoon and had several "discussions" on which line to take to our destination. 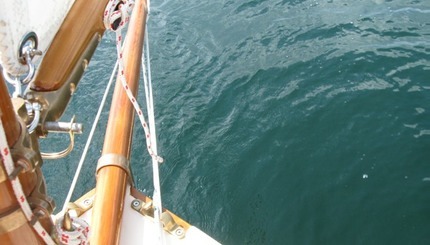 The final revelation of the afternoon was that an Eun Mara under just mizzen and jib WILL tack reliably provided she has around 3 knots of headway before coming about and there are very small or no waves present at all. I believe this proves that the seas are the real culprit here. The boat still gets tons of attention every time we take her out. A few times now, youngsters have called her a "Pirate Ship". A bystander walked up to us and asked: "Is that made of real wood?" While sailing, a small biplane kept flying by until finally, it came by us very low (est 300 feet) at which time we waved and were rewarded with much wing wagging. Finally as we were bouncing along at 4.6 knots (I love my GPS) I looked over to see a local sailor (in a 30-ish foot C&C cruiser) passing upwind of us allowing me to get some very nice photos of his sails backlit by the sun. A New Eun Mara in Venice, as in Italy! Congratulations for your site and your Alistego. 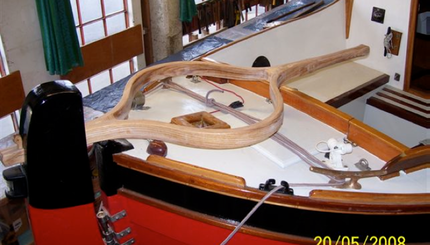 you inspired me in choosing this boat three years ago, for my father, now a young sailor..
Maybe you will be interested in this new from Venice, Italy. Here is the �Eun na mara �"Takatani" launched in Venice, designed by Iain Oughtred and professionally built by Roland Poltock, the same master shipwright who built the Ness yawl I sailed the Po river with, for Giuseppe De Stefano, my father, who, at the age of 78 will start sailing. The boat is equipped with an ASMO 6 kw electric engine, so smooth and quiet..(not to talk about the astonishing power and torque). 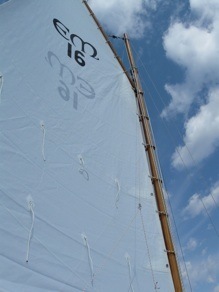 Soon the pics of the boat fully rigged and with the tanned sails made by Ombra Renzini e Daniela Cometti. 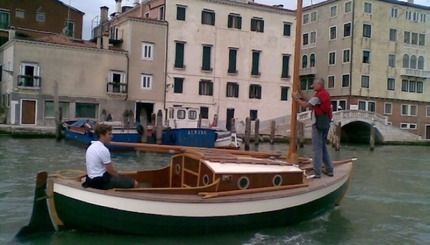 Something new in venice to fight the water taxi noise and waves. Well done and we’re all looking forward to some great sailing stories from the “old world”. See all Giacomo’s photos here. 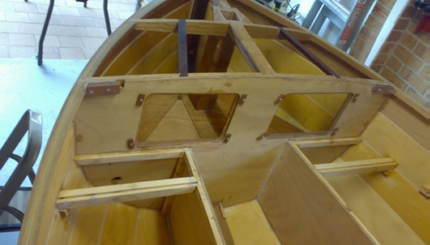 Richard has been making good progress on the aft cockpit area of his Eun Mara, Skerry. While you’re there, check out his installation of his electric power unit. Very interesting stuff. got a new log book entry after too long a time. rough stuff hit just as he managed to escape to the marina. cockpit and let's get sailing. seers passing nearby very slowly to get a good look at us. of the luff was attached to the mast in any way shape or form! we're good to go again. was clearly visible in front of our bows. we approached the ramp. Oh well, live and learn. girl still has it, she's one fine looker!" Long time followers of this site will recognize the name of the boat shown above though they will certainly be hard pressed to recognize the actual boat as she looks very different now! 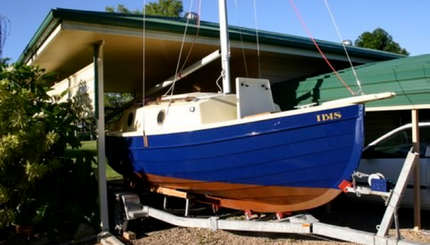 Ibis was built in Perth by Mike, one of my very first correspondents when I decided to build an Eun Mara of my own. He was a big help when I finally got building Alistego but things change and soon after launching her, he sold Ibis and I lost touch with him soon after. Fast forward to a few weeks ago when I received an email from Richard saying that he was in contact with the current owner of ibis. 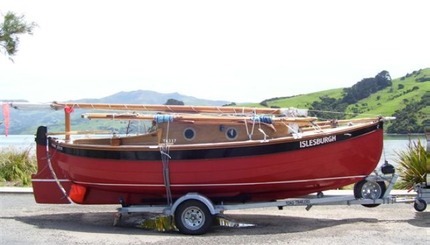 To make a long story short(er)- he had bought the boat from a neighbour and had re-rigged her as a sloop and was wondering if Richard was interested in the original spars. Oh, and the boat was now living on the east coast of Australia! Apparently, the previous owner had converted Ibis into an open launch, and as the recent pictures, once again has a proper cabin and looks quite nice with her blue hull. Check out more pictures here. Another Eun Mara hits the water! ... 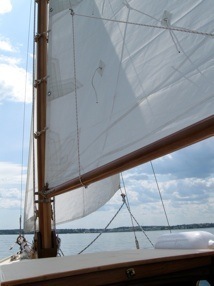 I took the boat out again today and this time got the mainsail up. I have found the boat pleasingly responsive and stable with three of us on board. 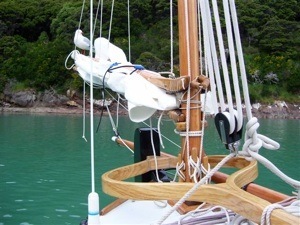 I will need to tune the fitting for the gaffs, the high angle makes it very hard, and I will have to look at the rake in the mast, there does not seem to be much there at the moment. Congratulations Ron and Liz, she’s a beauty! More pictures can be seen in the gallery, here. Yet another Eun Mara has been launched! 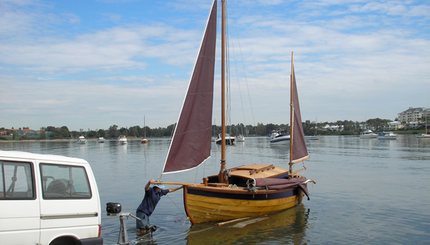 Howard has launched Meander and has details and photos on the Wooden Boat Forum. He has a great video of the event here. 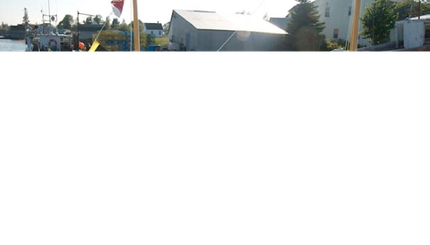 Finally a view of the jib sheet traveller. The original design showed fixed “bull’s eyes” for sheet leads. I wanted something with some adjustability built in. The cost of bronze track and sheet cars was a bit steep but I did have a brass “dinghy gooseneck” originally bought for the� mizzen mast that I wasn’t going to use. After some imagining and fiddling with some shackles and blocks, I came up with this arrangement.� So far it has held up to some pretty good winds. For Alistego we decided to not use winches for sheeting the jib. Our reasoning for this was simple. 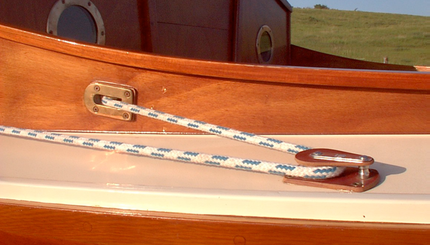 We had previously owned a boat with the same sized jib and had no trouble whatsoever handling it without a winch. Besides, we have no interest in racing, so how hard is it to head up into the wind, pull in the sheet and then bear off a bit? 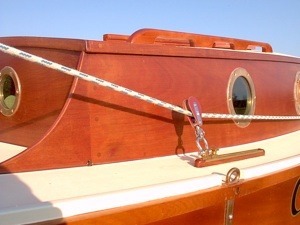 The title photo above shows the deck hardware at the cockpit end of the system. 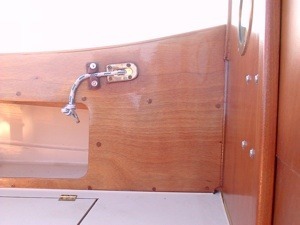 It’s very simple, the sheet comes from the bow to a cheek block on the deck and through the cockpit coaming thanks to the neat little bronze fitting shown. All parts came from Classic Marine in the UK.